I’m sure I don’t need to define how a well-bred German Shepherd Dog looks like. Known for its unswerving intelligence, working ability and royal personality, German Shepherd Dog has always been one of the most preferred and most liked dog breeds in the world. Beauty is in his within! The way he looks at me, the way he moves, his gesture and everything he does, he does it in style. This might be another big reason for GSD to become the most popular breed world wide. The strikingly beautiful German Shepherd Dog is quite a lot powerful, with strong bones, courageous and self-assured, loyal and protective and can make an amazing companion. Here are a bit about the standard of German Shepherd Dog. When I talk about the German Shepherd Dog standard, I talk about a specimen that’s well-bred, keeping in view the grammar of breeding. Thorough understanding of the physical structure is necessary to identify a well-bred German Shepherd Dog. Head: The Size of the head must be in perfect proportion to the size of the body. Technically the length of the head should be approximately 39% to 40% of the dog’s height at wither. Head should neither be too large and/or overlong, nor should it look smaller as compared to the body size. Head should be clear, fairly broad between the ears, and should have a slightly domed forehead with very little or no trace of centre furrow. Deep centre furrow in a GSD forehead is undesirable. Skull: The broad skull, that starts from the base of the ears and extends up to the nose bridge, should be at least 50% of the total head part as per the GSD standard. This means the skull ends right where the bridge of the nose starts and tapers slightly downwards with a gentle slope and extends further into a powerful Wedge-Shaped muzzle. Stop: Remain 50% of the head is Stop, which is strong and well built. Muzzle: The GSD muzzle should be wedge-shaped, strong, firm and powerful and must be parallel to the forehead. Too short or blunt or not-so-strong or over long and pointed muzzle are not only desirable in a well-bred GSD. Loose flap of skin in the muzzle is not desirable. Ears: Ears shouldn’t be too long or too short and should be broad at the base. Right proportion to the head is necessary. GSD ears must be firm textured and should be erect with proper curve at the tips. Ears with pointed tips or narrow curves are treated faulty. Ears shouldn’t be pulled inward or pushed outward. Gap between the ears at the base must be in right proportion to the size of the head. GSD ears usually starts standing at the age of 8 to 10 weeks, but may sometimes be delayed to upto even 6 to 7 months in puppies with comparatively larger and heavier ears. Faulty Ears: Faulty ears in GSD require a broader explanation. Certain genetic traits are responsible for serious faults in ears. Soft Ears: Ears that never stand, which is typically a genetic trait. Not only undesirable, but this is a serious fault and disqualification. Friendly Ears: Ears that erect but not with firm texture. They wiggle at the tips as the dog trots or gallop, which is though not a disqualification, but undesirable. Floppy Ears: Ears that stand but are dropped down at the tips. Note: Ears, though erect, of some German Shepherd Dogs are folded back while trotting. This is neither a fault, nor disqualification, nor again undesirable. Eyes: GSDs have ‘almond eyes’… meaning the shape of the eyes is like an almond. The medium-sized should not be protruding and should have dark brown pigmentation at the maturity, although lighter pigmentations are also found, which is not desirable. Too faint eye color is a serious fault. The general harmony of the eyes should be in right proportion to the head to give right facial expression. Eyes should give an expression of intelligence, curiosity, inquisitiveness, attentive, lively and self confidence. Dentition: Jaws should be quite strong, healthy and firmly developed, with healthy teeth. Upper jaw has 20 teeth, including 6 incisors, 2 canines, 8 premolars, and 4 molars. Lower jaw has 22 teeth, including 6 incisors, 2 canines, 8 premolars, and 6 molars. Normal dentition makes a combination of 42 teeth all together. Incisors Set: 6 incisors of the lower jaw are set just behind the 6 incisors of the upper jaw. Missing incisors are rarely seen. GSD Bite: Due to the incisors settings, the dogs holds a bitten article in a scissor grip. The bite of German Shepherd Dog is a called “Scissor Bite”. Neck: German Shepherd Dog neck should be fairly long and strongly built, with well developed muscles. Short neck is undesirable and treated faulty. Throat should be free from throatiness (dewlap) – excessive folds of skin at the throat region. Very slight dewlap may be present. The neck should be held at an angle of 45 degree, which may be raised further when excited and lowered a bit when trotting. Forequarters: Forequarter includes the shoulder blade, front pair of legs, upper arms, elbow and pastern. Shoulder Blade – As per the German Shepherd Dog standard, the Shoulder Blade should lay flat to the body. The Shoulder Blade sets obliquely at an angle of 45 degree. Upper Arm – Upper arm is attached to the shoulder blade at 90 degree. Upper arm should be strongly built, with well developed muscles to give an impression of massive innate strength and power. Forelegs – Forelegs, from the elbow to the region of pastern, should look straight, when viewed from any angle. The bones should be strong, oval and never round. According to German Shepherd Dog standard the length of the foreleg should exceed the depth of chest at a ratio of 55% to 45%. Pastern – German Shepherd Dog standard puts special attention on the pastern. The pastern should be firm and supple. As per the standard, the pastern should be angulated at an angle of 20 degree to 23 degree and should be approximately 1/3 rd of the length of the forearm. Too steep or soft pasterns are undesirable. More close to this standard ensures more balanced gait of German SHepherd Dog. Elbow – Elbow should neither turn inward nor twist outward. The length of the foreleg must extend at least beyond the lowest point of the brisket by 55% approximately. Feet: Feet should be well built, compact and well arched. Toes should be set closed tight to each and must form a well arch. The well developed, heavy-duty pads should be durable and cushioned and not brittle. The nails should be dark, strong and hard. Dew claw may present in hind legs too, although not commonly found. Body: Well muscular body should give an impression of power. The Length should exceed the Height so as to give a slightly longer look. According to German Shepherd Dog standard, the Length : Height = 10 : 9 or 10 : 8.5. Chest: GSD is a deep-chested breed. The Standard of German Shepherd Dog breed requires the depth of chest of a well bred specimen to be around 45% to 48% of the height. The chest should be broad enough with well developed and fairly long brisket. However, too broad chest distracts the endurance of gait, which has an adverse effect on the working ability of the dog and is hence a disqualification. Ribs: The rib cage should be broad and wide enough, long and well formed. It should neither be too flat, nor barrel shaped. A bit too wide rib cage will make the elbow turned out, which will disturb the movement of the elbow while on move. Too narrow rib cages will make the elbow turn in, which again distracts the gait. Hence both these extremities are undesirable. Abdomen: Abdomen should be firm and slightly concave – not bulging out, rather slightly tucked in. Loin: Broad and powerful loin should be well built and quite muscular to give an impression of great innate strength. The GSD withers are higher than the back and slopes towards the rear. The German Shepherd Dog back is straight and strongly developed without any droop or roach. The higher wither give it an appearence of slightly slopping from front to back. Many breeders prefer a very slightly gentle curve (almost straight and not perfectly straight), which reflects their lack of knowledge about the German Shepherd anatomy. Too long topline is both undesirable and disqualification. The overall length is not derived from a long back, but is achieved by the correct angle of the shoulder, correct croup length and right hindquarters. Topline is well judged when the dog is stacked properly. Arch back, roach back, banana back are disqualifications as they disrupt the structure, thereby disrupting the gait. Week and soft back are disqualified. Wither: Well built wither should have a good height. German Shepherd Dogs must be high at the wither, which is desirable. Wither should join the back of the dog in a smooth line instead of any abrupt change in the structure and without disrupting the smooth flow in the topline from wither to where the croup starts. Croup: Croup should be moderately long, broad and gently downward slopping towards the tail at an angle of approximately 23 degree. The slight downward slope should not disrupt the flow of the topline. Short, flat, steep and narrow croups are disqualifications; too long croup are not desirable either and hence rejected. Hindquarters: Hindquarter of German Shepherd Dog includes thigh, upper thigh bone (femur), lower thigh bone, Hock and the rear legs. Thigh should be well developed, muscular and broad so as to give an impression of power. While having a side wise look, the upper thigh bone (femur) of a German Shepherd Dog should slope gently to the slightly longer hock. The angulations of the hindquarter should correspond to the front angulations in perfect proportions (without being over-angulated or under-angulated). Dogs that display over-angulated structure when stacked may look good in some eyes, but are undesirable. Powerful hindquarters should be strong enough to give powerful forward propulsion, to make the dog move forward in high pace effortlessly. Upper Thigh: Broad with well developed muscles. When viewed side ways, the upper thighs are almost diagonal to the lower thighs and are connected to each other at an angle of 120 degree approximately, provided that the forequarter is neither over angulated nor heavily under angulated. Hock Bones: Hock bone should be strong, moderately long with the well curved stifle. Hock joints should be powerful and strong. Hock joints should not be tucking in (cow hock) or twisted out. These are undesirable as well as disqualification. 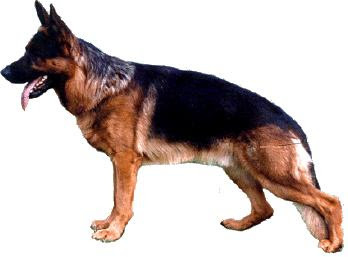 Cow hock in German Shepherd are very commonly seen and should be excluded out of the breed program. Due to the deviation from the alignment of hock joint, the dog cannot deliver right degree of propulsion and the gait won’t effortless. Gait of German Shepherd Dog: German Shepherd Dog with right structure and mental soundness, should exemplify a royal movement. GSD is a trotting dog and is the most outstanding trotter. His stepping sequence follows a “Diagonal Movement”. He always moves his foreleg and the opposite hind leg in opposite direction. Without a highly balanced structure a GSD cannot be a good trotter with Diagonal Movement. Strong and well balanced limbs enables him to deliver right degree of propulsion so as to get an extensive reach. A well balanced gait requires the dog to make the maximum coverage of ground by giving hard thrust with his hind foot that takes him well forward to reach exactly middle point of his body, simultaneously the opposite front foot well extended forward, without and noticeable change in the topline that remains still sloping from front to back. While in brisk trotting the head is taken slightly forward, neck lowered, tail slightly raised upward (not sickle tail or gay tail) and ears may sometimes slightly folded back but must be of tough textured and firm. The overall idea is, while in trotting the gait should be perfectly free from bounciness smooth, supple, and long reaching. Tail: Tail should be at least as long so as to reach the hock joint but not to extend beyond the mid point of the hock. It should be bushy without any kinks, curls, twists, or any other interruptions, and shouldn’t be carried upward. Although undesirable, yet slightly sideward-bent tails with hook at the end, are seen and is not a disqualification. Sickle tail and gay tail are serious faults and hence disqualifications. Tail raised beyond the horizontal is faulty and is disqualified. A very strong willed and a dominant dog will carry his tail up, especially seen in males. Moreover, dogs bred for working often have high tails. A high set and a high carriage are different of course. Desirable is that a correct tail set of a strong dog can be carried up at approximately 45 degrees from the level. German Shepherd Dog Coat: German Shepherd Dogs comes in three distinctive categories of coat. Normal Coated GSD carries think under coat and closely lying, dense, hard, and straight guard coat. We do not have a standard regarding the length of the coat, but too short hair is faulty and is disqualification. The guard coat should be waterproof and seasoned for all season, weather and environment. Long Coated GSD comes with fairly longer hairs, which are not always straight and do not lie flat and are not closely compact. Hairs inside and the back of the ears, back part of the front les, loin area and the throat are very longer. This type of coat is usually not waterproof and hence is not desirable, especially for working line German Shepherd Dogs. Open Coated GSDs are long haired GSDs, whose hairs are longer than the Long Stock Coat/ Long Stockhaarige version. The hair usually part on the back, forming a parting line along the back bone. The texture is slightly silky and not water resistant. Sometimes, such GSDs are found with a bit longer muzzle, with narrow appearance. The degree of protection and working ability are seriously diminished because of the low degree of body heat radiation, which makes the dog easily exhausted. Color Pattern: The German Shepherd Dog Standard has a say about the color patter and pigmentation too! Read on about the color pattern in GSD. Behavior: The German Shepherd Dog standard ahs some to say about the behavior and temperament of the dog. Click here to know more about the GSD behavior. Hello! nice reading on GSD. I ve bought one gong to b 12wks old .much of the information found here is applicable but much not. Am confused. Like our pups tail remain mostly up above horizontal with a curl. Ears aren`t straifht as yet.Tolerance is quite low. earlier also I had 1 GSD. Had to leave becoz of some bad traits. @above[Sam] : i agree with you.This does not resemble shape or structure the German shepherd breeds that were in 1970's. The slope in the hind end can sometimes be so extreme that the dogs cannot climb stairs. I dont know with what reference the author has written about its physical structure. Thank you... for your guidance sam and Mourya. Dear whoever this may concern, Drop back (roach back, half dog half frog) whatever you want to call it. There is one thing for sure, that they are bred ONLY FOR THE SHOW RING, for there look and no more or less. These dogs are 90% insest, makes me sick to even think about! What people want but dont know is that they want Working GSD!!! Those who show their dogs in conformation also want a dog that has great working ability. That is the ideal. While their may be some that don't care about working ability, they are the minority. There are just as many that only breed for working ability which is also wrong. Many of those dogs are so over the top the general public can't live with them.